Richard Wilbur, poet and writer, has twice won the Pulitzer Prize and served as National Poet Laureate. 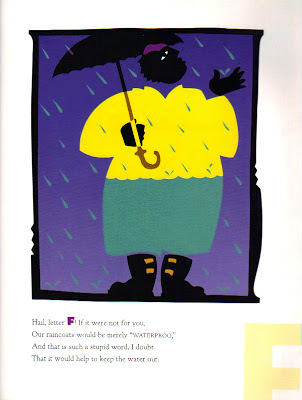 In 1998 a series of poems he wrote for The Atlantic Monthly was paired with the magnificent artwork of Caldecott winning illustrator David Diaz. 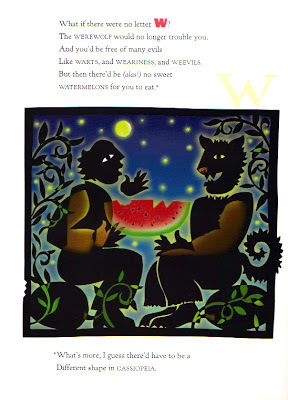 Diaz is also a gifted graphic designer, which shows in his work, especially his illustrations for Newbery winner Sharon Creech's book The Castle Corona, which has the feel of an illuminated manuscript from the middle ages. The world, the world would start to vanish, too! If everything dissolved to nothingness! 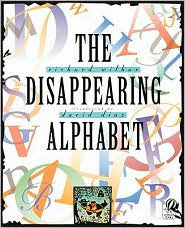 Anything happen to the alphabet. 26 poems follow, each one imagining a world without the corresponding letter. All are thoughtful and playful, as are Diaz's illustrations. Definitely a book worth having on the shelf and surely one that will inspire minds to imagine the world in a new and different way. Our raincoats would be merely "WATERPROO,"
That it would help to keep the water out. What if there were no letter W? Like WARTS and WEARINESS, and WEEVILS.